Beat 100 continues to grow at a rapid rate and the company is eagerly anticipating new expansion in the coming months with added features soon to be revealed and a whole host of new and exciting bands gracing the site with new videos and new songs every day. Beat 100 is a new social network for music and videos and is pleased to report on its growing successes as the place for new music and for showcasing the very best of world music talent. The site has been growing exponentially since its release in October last year and is quickly coming to dominate the music video networks thanks to its cash competitions, band promotion opportunities and integrated social networking. Beat 100 is the brainchild of David Donovan who previously brought about the incredibly successful Celeb Poker which mixed poker with, of course, celebrities. David had huge success with this foray into the incredibly competitive world of online gambling and is now anxious to use the lessons and skills he learnt to make a new and more rounded social network experience. 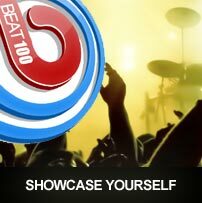 Music promotion and new bands are at the forefront of what Beat 100 hopes to accomplish. Large parts of the social networking site revolve around the music video charts where people can discuss, rate and vote for their favourite new and emerging bands. Bands submit their music videos to the website and then win cash prizes based on how many votes their music video receives. This is already proving a great feature with thousands of votes being cast each week as bands and fans compete to win a share of the whopping $1000 cash prize pool. 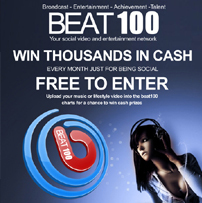 Bands also receive free press coverage and news features making Beat 100 an exciting new platform for new and unsigned artists. Capitalising on their existing success Beat 100 has recently launched video awards that give artists additional recognition for production values, musical talent and for being generally great songs. The new system also allows users to vote every 24 hours for their favourite videos which has made the competition for the illusive first place even fiercer this month. At the same time Beat 100 recently began a program of live events to showcase local talent and is looking forward to expanding this venture around the UK and abroad in coming months to provide a complete new music experience for all of the sites members and for bands. Beat 100 continues to grow at a rapid rate and the company is eagerly anticipating new expansion in the coming months with added features soon to be revealed and a whole host of new and exciting bands gracing the site with new videos and new songs every day. 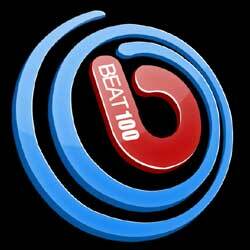 Beat 100 is set to become the next big thing in the music world and the social networking sphere and things are very exciting for the company.